Moving the Needle: Aramis Ramirez walks off with a single, +.368 WPA. Neither team scored through six, but in the seventh the Cubs led off with a double and a single to record the first run. The Giants added theirs in the top of the ninth, also after a leadoff double and a single. An intentional walk and a single loaded up the bases, but a ground ball double play ended the threat. 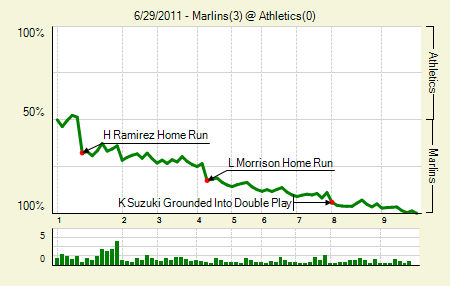 That would have been the biggest WPA swing if not for Ramirez’s walk-off single with two outs in the ninth. Ryan Dempster: 8 IP, 3 H, 1 R, 0 BB, 6 K. The run scored after Carlos Marmol came on in relief, though Dempster did allow the leadoff double to set up the tying run. Tim Lincecum: 7 IP, 5 H, 1 R, 2 BB, 9 K. One of the walks was intentional. That’s seven out of 17 starts with nine or more strikeouts. 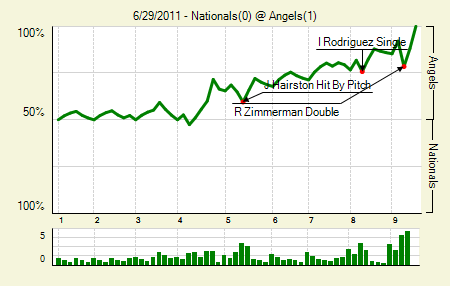 Moving the Needle: Ryan Zimmerman gives the Nationals a fighting chance in the ninth, +.136 WPA. The lone run in this game scored on a double play ball and therefore was a negative WPA play. The high mark came in the ninth, when Zimmerman slapped a grounder down the first base line and into right for a double. The hit came with one out, giving the Nats two chances to tie the game. But a ground out and a strikeout ended it. Dan Haren: 7.1 IP, 2 H, 0 R, 1 BB, 6 K. He was removed after allowing the second hit, which came on his 120th pitch. Jordan Zimermann: 8 IP, 4 H, 1 R, 1 BB, 4 K. If Zimmerman and Espinosa connect on that double play ball in the fourth the Angels don’t even score their run. Moving the Needle: Stephen Drew’s solo shot brings the DBacks to within two, +.098 WPA. So there’s a head-scratcher of a high WPA swing. The Indians jumped out to a 4-0 lead by the end of three, but only the fourth run scored on an out. With the first three coming on hits, I’d think that one of them would get the nod for biggest WPA swing. 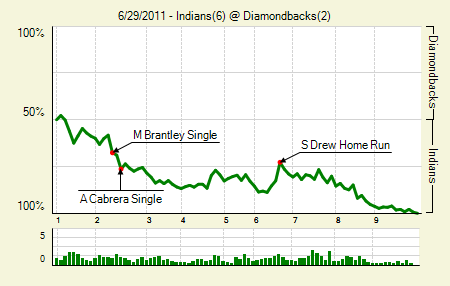 Instead it was a solo home run to lead off the sixth, which made it 4-2 Indians. The homer was the last of their scoring, though. The Indians tacked on two later in the game to wrap it up. Orlando Cabrera: 4 for 6, 1 2B. He scored two runs and drove in one. Asdrubal Cabrera: 3 for 5, 1 2B, 1 BB. The walk was intentional, following Cabrera’s double. Carlos Carrasco: 7 IP, 4 H 2 R, 0 BB, 7 K. He did hit two guys and allow two solo homers. I’m not sure if that makes his start more or less impressive. Moving the Needle: Colby Rasmus opens up the scoring with a two-run blast, +.181 WPA. 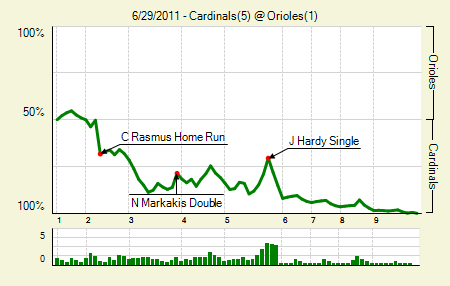 The Cardinals jumped out to a 4-0 lead after the third, and the Orioles are quite lucky that it wasn’t more. The second inning was innocent enough, though Rasmus did blast a two-run shot to set the tone. The third inning was a bit bigger, as it started with a ground rule double and rolled from there. Two singles, a hit by pitch, and a sac fly made it 4-0, and only a double play ended it. But that was enough to stay ahead the rest of the way. Chris Carpenter: 9 IP, 7 H, 1 R, 1 BB, 5 K. That brings his ERA down to 4.00, inching it closer to his 3.26 FIP and xFIP. Skip Schumaker: 2 for 5, 1 2B. That’s a good game and all, but he’s still a guy with a sub-.300 OBP hitting leadoff. Blech. Moving the Needle: Scott Hairston’s triple opens up a four-run lead in the first, +.207 WPA. 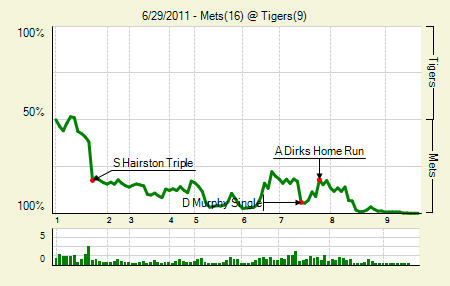 The Mets have loved Tigers pitching in this series. On Tuesday they put up a big number, and yesterday they announced similar intentions from the get-go. With the bases empty and two outs the Mets got a single, walk, and single to load the bases, and then Hairston brought them all home with a triple into the right-center field gap. They added one in the third, and then got another pair in the fifth. The Tigers did battle back, making it 10-8 Mets in the seventh, but the Mets put up four in the eighth to put some more space between them. Miguel Cabrera: 2 for 4, 2 HR, 1 BB. He drove in four and generally destroyed in the game, but one man can only do so much when the pitching is that horrible. Ronny Paulino: 4 for 6, 2 2B. He scored a team-high four times. Angel Pagan: 4 for 6, 2 2B. He scored three times and drove in four runs. His slow start, which included an injury, has apparently halted. In the last two games he’s raised his BA and OBP by 26 points each, and his SLG by 38 points. 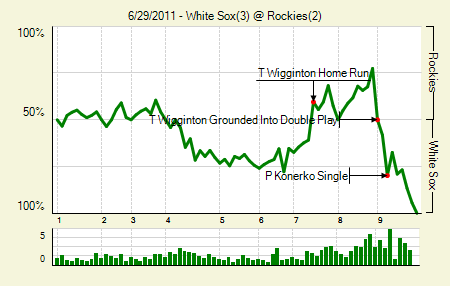 Moving the Needle: Ty Wigginton grounds into a double play to blow the opportunity in the eighth, -.275 WPA. An inning earlier Wigginton hit a solo homer to tie the game at two, which brought about a healthy +.204 WPA swing. In the eighth the Rockies rode a single and two walks to a bases loaded, one out situation. That brought Wigginton to the plate again, but this time he hit a grounder to second that killed the opportunity. As the fates would have it, the Sox would pick up a run the next half inning, putting them in a position to take the game. Carlos Gonzalez: 3 for 4, 1 3B. He’s 14 for his last 34 with three doubles, a triple, two homers, and five walks. In that nine game span he has six multi-hit games and three zero-hit games. Ubaldo Jimenez: 7 IP, 4 H, 2 R, 2 BB, 4 K. It’s not Ubaldo 2010, but he’s definitely found a groove lately. Moving the Needle: Ben Revere’s triple sets up the lone run, +.090 WPA. After setting down the Dodgers in the first the Twins got off to a great start when Revere tripled into the right-center field gap, right to the Harmon Killebrew signature. One batter later, Tsuyoshi Nishioka slapped a ball to the right side just past the pitcher to bring him home. It might as well have been a bunt, since it resembled one perfectly. That was it for the scoring on the day. Scott Baker: 7.1 IP, 6 H, 0 R, 1 BB, 9 K. He’s working on a career-high strikeout rate now, 8.60 per nine, and is keeping the ball in the park. Considering his lower than normal FIP and xFIP, this has career year written all over it. Rubby De La Rosa: 7 IP, 6 H, 1 R, 2 BB, 4 K. Hey, I’m just glad I got to type the name Rubby. Coincidentally, it’s on the list of names to give your child if you secretly seek a divorce. Moving the Needle: Michael Bourn’s been caught stealing, -.159 WPA. Bourn enjoys stealing, it’s just as simple as that. He does lead the league in them. He tried to walk right through that door in the eighth, with the Astros down by one, but Yorvit Torrealba had other plans. He gunned down Bourn, taking the tying run off base and making the job easier for his bullpen. 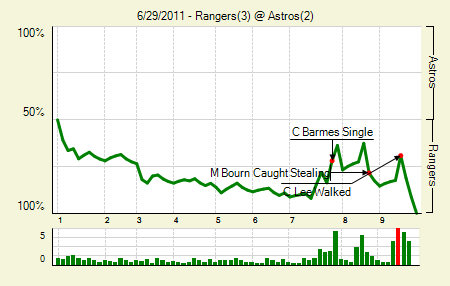 Strangely enough, the game ended on a caught stealing, too. What business Carlos Lee had trying to swipe a bag with two outs in the ninth I have no idea, but the Astros paid for it. Colby Lewis: 6.2 IP, 6 H, 2 R, 0 BB, 6 K. In his last three outings he’s gone 20.1 IP, 14 H, 4 R, 4 BB, 24 K.
Ian Kinsler: 2 for 4, 2 HR. He hit a homer to lead off the game, and then hit another solo shot to lead off the third. 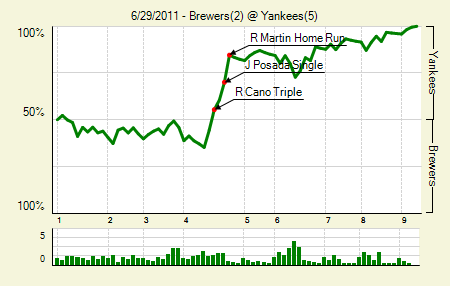 Moving the Needle: Russell Martin goes yard and puts the Yanks ahead, +.145 WPA. After getting trounced on Tuesday the Brewers jumped ahead with a first-inning run last night. The score remained that way through three and a half, but the Yankees got to work in the fourth. Robinson Cano led off with a triple that was just out of Nyjer Morgan’s reach. Give Morgan credit, too; it looked like he ran into the wall at full speed, but he simply got up and kept playing. Nick Swisher drove in Cano with a single to tie the game, and after a another single Martin launched one over the fence in left to open up a 4-1 lead. It was his first homer since May 24th. He hit nine before that. Jorge Posada: 2 for 3, 1 HR. His David Ortiz-like transformation continues. A.J. Burnett: 7 IP, 7 H, 2 R, 2 BB, 4 K. His starts haven’t been pretty, but he’s been effective when not facing the AL East. 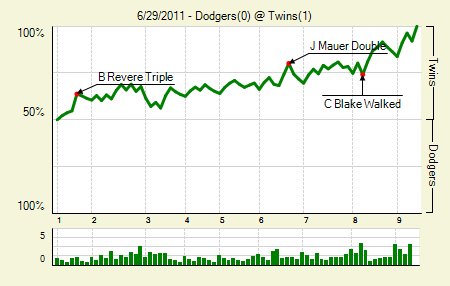 Moving the Needle: Raul Ibanez’s homer breaks the tie, +.208 WPA. Sometimes when you want one you have to go down and get it. That’s what Ibanez did in the seventh inning last night. Lackey delivered a breaking pitch that dipped low in the zone, and Ibanez got his arms extended and popped it over the wall in right. That broke the 1-1 tie and eventually sent the Phillies to victory. Vance Worley: 7 IP, 5 H, 1 R, 2 BB, 5 K. Not only did he hold the vaunted Red Sox lineup to five hits in seven innings, but he held some of their bigger bats hitless. Josh Reddick actually had two of those hits, and Lackey had one. So good job all around by Worley. John Lackey: 7.2 IP, 8 H, 2 R, 1 BB, 5 K. That’s certainly an encouraging start, despite the pitcher-loss he incurred. Which just further convinces me that if they named the win stat something else, people would care far, far less about it. Because it really isn’t that high a distinction. 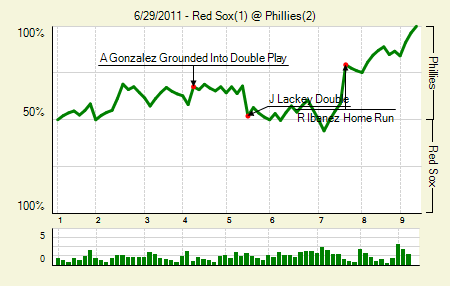 Moving the Needle: Hanley Ramirez knocks a two-run homer in the first, +.191 WPA. I don’t think there has been a Marlins game this year where a Hanley homer moved the needle furthest. So, welcome to the club, Hanley. The homer went way out to dead center, over the 400 sign out there. It was impressive, no doubt, and also encouraging. It was his first homer since May 21st, and only his third extra base hit since then. Ricky Nolasco: 9 IP, 5 H, 0 R, 2 BB, 3 K. His strikeouts are way down in general, but he’s been quite effective despite them, a 4.08 ERA and 3.43 FIP (3.48 xFIP) through 110.1 innings. Emilio Bonifacio: 2 for 4, 1 2B. He got on base ahead of Hanley’s homer. 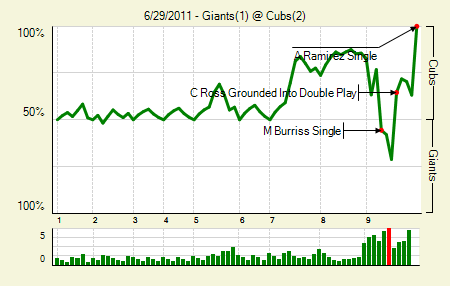 Moving the Needle: Anthony Rizzo breaks the tie with a two-run single, +.217 WPA. All of the run scoring in this one took place in the third inning. Eric Hosmer got the only RBI for the Royals, driving in Melky Cabrera, who doubled. In the bottom half the Padres rode a leadoff error to a big inning, tying the game on a Ryan Ludwick double and then taking the lead when Rizzo brought home both of the base runners with a single. Orlando Hudson then drove home Rizzo to make it 4-1. 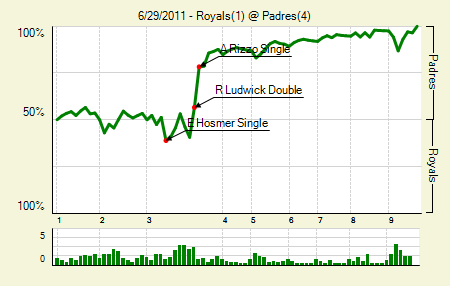 The Royals made some noise in the ninth, but Heath Bell eventually bore down and got them. Tim Stauffer: 7 IP, 4 H, 1 R, 2 BB, 6 K. He’s relatively cheap, and so fits the Padres that way, but I’m starting to wonder if they would do best to sell high at the deadline. Moving the Needle: Brooks Conrad singles home the first run, +.160 WPA. After a scoreless first three innings, the Braves got on the board in the fourth when they got three straight two-out singles. The last came from Conrad, who drove in the only run in the inning. 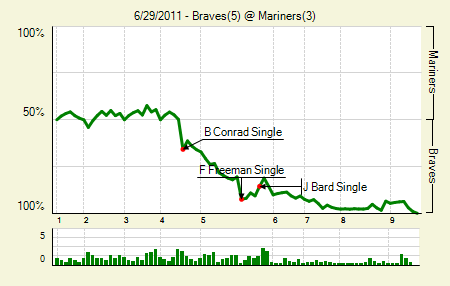 In the fifth the Braves picked up another three, one on a wild pitch and two on a single. That was enough scoring to give them the game. Derek Lowe: 6 IP, 4 H, 1 R, 3 BB, 5 K.
Freddie Freeman: 3 for 4. He drove in two. In a game where the only extra base hit came from the losing team’s backup catcher, the man with three singles wins. Josh Bard: 2 for 4, 1 2B. The backup catcher with the lone extra base hit! 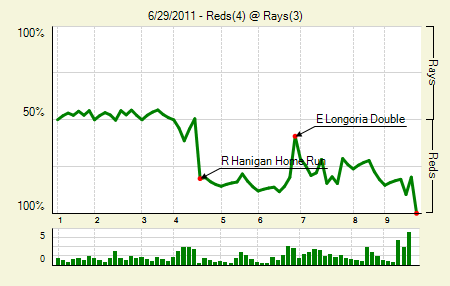 Moving the Needle: Ryan Hanigan’s three-run shot opens up a Reds lead, +.320 WPA. The Rays had to like their chances with James Shields on the mound in the rubber game, and through three that outlook didn’t change. But that’s when an old enemy came back to bite him. Two singles opened the inning, and then, after he got two strikeouts, Hanigan lined one over the left field fence to give the Reds a 3-0 lead. It was just the 13th homer Shields has allowed this year, after allowing 34 last year. The Rays battled back, but the Reds fought them off and took home the series. Evan Longoria: 1 for 4, 1 2B. He drove in two runs to help close the gap after Hanigan’s homer. Edinson Volquez: 6.1 IP, 4 H, 3 R, 3 BB, 7 K. It wasn’t overly impressive, but there weren’t too many notables in this one. Moving the Needle: Yunel Escobar doubles home the go-ahead run, +.179 WPA. 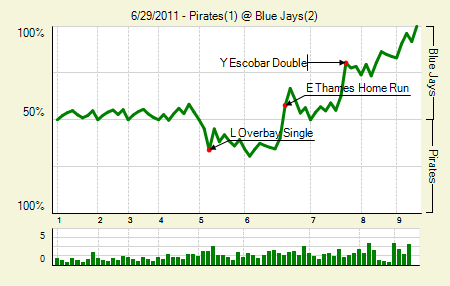 The Pirates took the lead in the fifth, but that was all they had in this one. The Blue Jays struck with a solo homer to tie in the sixth, and then took the lead when Escobar followed up Rajai Davis’s double with one of his own, making it a 2-1 Jays lead. That’s where they’d finish. Brandon Morrow: 7 IP, 4 H, 1 R, 3 BB, 10 K. The one thing missing from his game was innings. That’s a good start, then. Paul Maholm: 7 IP, 9 H, 2 R, 2 BB, 1 K. I’m just impressed that he allowed 11 base runners while striking out just one and holding the Jays to two runs. We hoped you liked reading The Morning After: Game Recaps for June 29th by Joe Pawlikowski! Quade should have let Dempster finish the ninth. 83 pitches and no runs allowed when he got the hook.